Supermodel Naomi Campbell is in Nigeria has been pictured with some of the top people in the country. 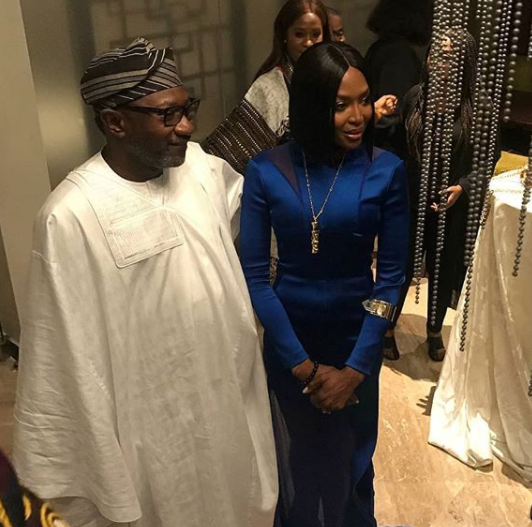 Yesterday, Naomi was pictured with President Buhari at the Eko Atlantic City, a photo which few hours later caused a stir online over Campbell’s claims that she was invited to the country by the president himself. Today, the model has been pictured with billionaire businessman Femi Otedola stunning in a blue dress. 0 Response to "Checkout Naomi Campbell And Femi Otedola In This Photo"